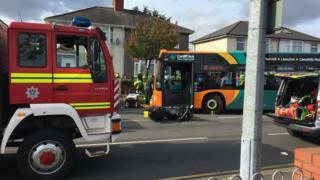 A motorcyclist has died following a crash with a bus in Cardiff. A 58-year-old man was arrested following the crash on the Caerphilly Road, Waun-Y-Groes Road and Ty-Glas Road crossroads, in Birchgrove. The collision involving the number 27 Thornhill to city centre bus happened at 12:10 BST on 17 October. Caerphilly Road was cleared by 16:05 after the police spent four hours carrying out investigations and recovering vehicles. Image caption The incident happened near the Lidl supermarket at about 12:10 BST on Tuesday.